Thus far, we have installed an energy monitor to track our electricity costs, and what is consuming the power. This will have delivered some results just by seeing the consumption on the monitor. Next, we replaced all light bulbs with LED bulbs, spending €22 and saving €27.01 per year. The next step addresses another form of energy spend – heating. 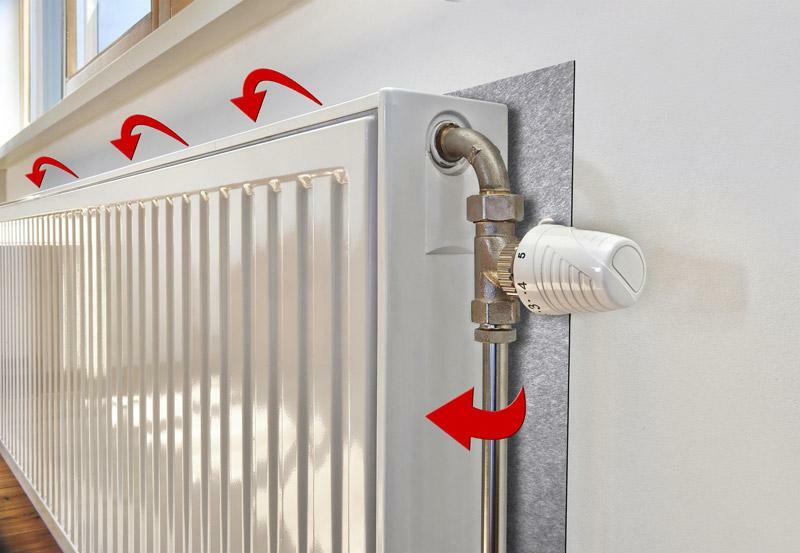 Step 3 aims to reduce heating costs with Radiator Reflectors. It’s a pretty simple one: Radiators which are mounted on external walls will radiate some of their heat into those walls and out into the air, at no benefit to you. 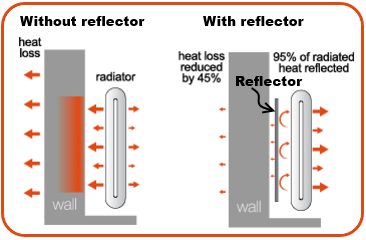 A simple measure to maximise the use of the heat generated in your house is to put heat reflecting foil behind those radiators to reflect that heat back into the house. 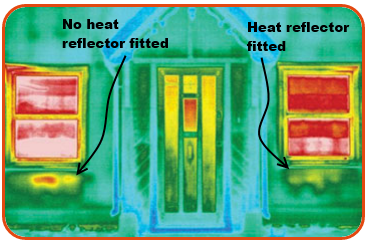 This is an infrared image showing a house with two radiators, one with a reflector and one without. You can see the increase in heat escaping uselessly outside on the side without the reflector. Here’s a video on actually fitting the foil. It’s about a 30 minute job and you can buy the foil online for less than $20, or at any hardware store. Heat energy seems different from electrical energy, but it’s actually not. We can measure both in kWh. We may get separate bills for electricity and gas (or oil, or whatever) but once we know how much they cost per kWh, the cost, kWh saving and payback of each energy saving step can be worked out for any measure and directly compared. The energy saving of foil reflectors depends on a lot of things, so we’ll need to generalise here a bit. The foil is reflecting heat which would otherwise have been absorbed and conducted out of the house by the wall behind the radiator. Some energy travels out of the radiator in the form of convection, not radiation, which won’t be effected by this process. Long story short – if your walls feel cold when your house is relatively warm, it means they are not well insulated and will benefit from radiator reflectors. Radflek is a reflector approved by the UK Carbon Trust. The reflector saves up to 83 kWh of energy per year. Gas currently costs €0.08 per kWh, so the yearly saving is €0.08 * 83 = €6.64 a year. The sheets cost me €13 each, so the payback is €13 / €6.64 = 1.96 years – just under 2 years. There are 7 radiators in our house, so the outlay is €13 * 7 = €91.00, which pays for itself in 2 years at a saving of €6.64 * 7 = €46.48 per year. The 25 year saving is 25 – 1.96 = 23.04 years of profit * (€6.64 saving per sheet per year * 7 radiators) = €1,070.9 of savings. That’s * 25 = 14,525kWh savings over 25 years. In terms of emissions, Gas emits .23kg CO2 per kWh from a gas boiler with reasonable efficiency, so the yearly saving is 581kWh of gas saved * .23kg CO2 per kWh = 133.63 kg CO2 averted per year, or 133.63 * 25 = 3,340.75 kg CO2 over 25 years. €1000 and 3 tonnes of CO2 saved with a few strips of aluminium foil – not bad! Do you know if there is a performance difference between brands? If they are all based on the same principle then surely the cheapest option is best to achieve this, but if a better product costs more then that may be worthwhile. Amazon.co.uk tells me I can get a 5m length of Exitex for £5.65, 5m of SuperFoil for £9.95, or the Radflek for £25 for an equivalent length in the 8-piece pack. Is Radflek really 5 times better than Exitex?